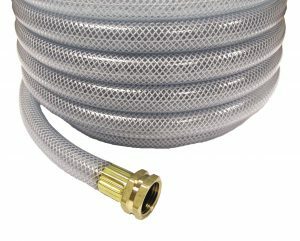 Clear Braided PVC Tubing is a versatile and economical tubing product suitable for many applications in fluid and air conveyance. The braided synthetic yarn reinforcement offers higher working pressure and greater tear resistance than standard PVC tubing, and allows for handling light vacuum. FDA & USDA compliant material for food & beverage applications. A heavy-wall version is available in select sizes. Clear braided PVC tubing can be cut and assembled to meet OEM application needs. An NSF version is available potable water applications. Tracer yarn and color options available for color coding. Custom diameters, thicknesses, and lengths available (minimum order may apply). IAPMO PS 33-2010 certified tubing products for spa, pool, and jetted bathtub use are available.